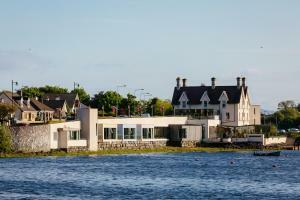 The beautiful Ice House Hotel is right on the River Moy Estuary at Ballina. It has stunning views, ultra-luxury bedrooms and the Chill Spa with its Waterside Garden. Bedrooms and suites at Ice House have floor-to-ceiling windows, super king-sized beds, Wi-Fi and flat-screen TVs with DVD players. The Ice House Restaurant and Cocktail Bar overlooks the River Moy and was converted from the building's original ice store. The spa facilities, which are free to use for guests include an outdoor barrel sauna, hot tubs, outdoor spa garden and a relaxation area. This beautiful and historic castle is set within 1,000 acres of woodland. On the banks of the River Moy, it boasts a restaurant made from the remains of a 17th-century Spanish galleon. 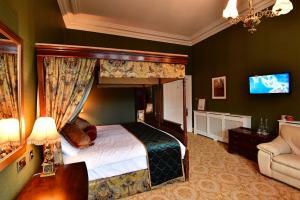 With stunning views of the forest and castle garden, each spacious room is elegant and richly furnished. Rooms include a private bathroom with complimentary toiletries, free Wi-Fi, and tea/coffee facilities. Plasma-screen TVs are available on request. Granuailes Candlelight Grill Room serves fresh country house cuisine, with Connemara lamb and steak flambéed at the table. 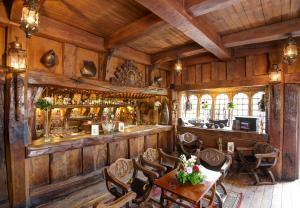 The Tween Decks provides fantastic, 17th-century nautical decor, and the Armada Bar is built from the salvaged, 400-year old wood of shipwrecked Spanish ships. 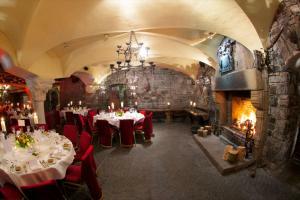 Guests can enjoy the 13th-century Norman fireplace of the Great Hall, or relax in front of the many open fires throughout the castle, with its suits of armour and numerous antiques. There is a large, secure parking area, and Knock Airport can be reached in 35 minutes by car. Lough Conn is 20 minutes' drive away, and the centre of Ballina is just a 5-minute drive away. 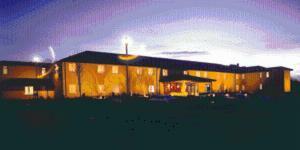 Twin Trees Hotel and Leisure Club is located overlooking the Brosna River, less than 1 miles outside Ballina town. It offers a hot tub and heated swimming pool, and elegant rooms with free Wi-Fi. Each room at Twin Trees Hotel includes a private bathroom and cable TV. Tea/coffee facilities are available for guests, as well as a hairdryer. Some rooms feature beautiful waterfall or garden views. Twin Trees Leisure Club includes a fully equipped gym for guests to exercise and a relaxing sauna. Homemade, locally sourced food is served in from 17:30 until 21:00 daily in the Twin Trees Bar and The Brosna Dining Room. Free parking is provided, and Enniscrone seaside resort, with its 3.1 miles beach, and Kilcullen's Seaweed Baths are a 15-minute drive away. Waterpoint indoor water park is just 5 minutes’ walk away. The Mount Falcon Hotel in Ballina sits on the banks of the River Moy. It offers large rooms with marble bathrooms, an award-winning restaurant, a spa, pool and free parking. 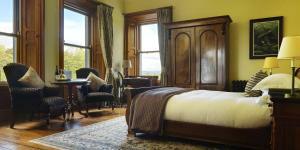 The rooms at the Mount Falcon Country House Hotel have flat-screen TVs and Wi-Fi access. They also offer bathrobes, slippers and free luxurious toiletries. 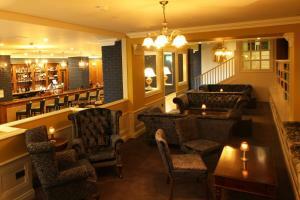 The 2 AA Rosette Kitchen Restaurant in Ballina serves fine Irish and international cuisine. There is an extensive wine list, with wines from around the world, to accompany the menu. The Mount Falcon has a gym, a sauna and its hot tub overlooks the hotels beautiful gardens. There is also a steam room and many treatments available at the Elemis Spa. The hotel offers guests 2 miles of private fishing along the river. 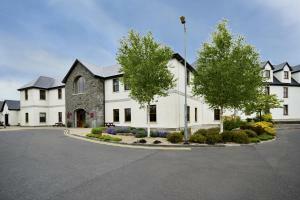 The Ballina and Enniscrone golf courses are both within a 5-minute drive of Mount Falcon House. 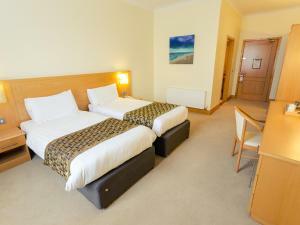 This hotel is easily accessible via the N26 Dublin road, and offers Tranquillity Leisure & Spa, and comfortable rooms with free broadband internet access. An elegant design and spacious surroundings await at Ballina. Stylish bedrooms combine classic luxurious fabrics, sensational beds and top-of-the-range amenities. The high ceilings and majestic windows add a feeling of grandeur. Mc Shanes bar and bistro has an inviting atmosphere and a range of dining options. 24-hour room service is available. The bus and railway stations are nearby. The family-run 3-star Downhill Inn is located just outside of Ballina in County Mayo. It offers affordable rooms, excellent service, a restaurant and free parking. Rooms at the Downhill all feature en suite bathrooms with showers, baths and hairdryers. They also include TVs, tea/coffee making facilities and Wi-Fi is available in most rooms. 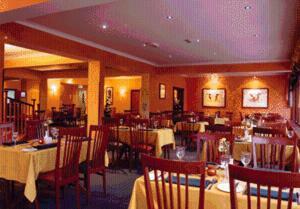 The restaurant has an a la carte menu and uses fine local produce. 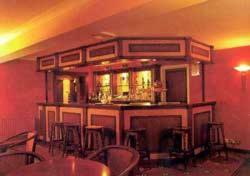 The bar has an extensive selection of drinks and a bar menu. The River Moy has excellent salmon fishing and is just a 10-minute walk away. Lough Conn is 5 miles away whilst sea angling is available at Killala Bay which is a 15-minute drive from the Inn. The Ballina and Enniscrone golf clubs are both within a 5-minute drive from the Downhill. The beaches at Inishcrone are 15 minutes drive away. Situated 4.3 miles from Mayo North Heritage Centre in Ballina, Lisdovogue House features free WiFi access and free private parking. Certain units feature views of the mountain or lake. For your comfort, you will find free toiletries and a hairdryer. You will find a shared kitchen at the property. Guests can enjoy various activities in the surroundings, including pitch and putt golf, horse riding and fishing on Lough Conn, which is just a 7-minute walk away. The property can provide boats for guests to use and day trips on the lakes are also available. Enniscrone Beach can be reached within 30-minutes by car. Fr. Peyton Memorial Centre is 5.6 miles from Lisdovogue House, while Presbyterian Church is 5.6 miles from the property. 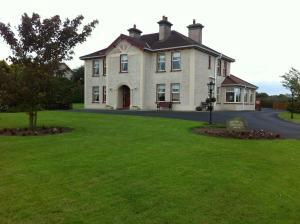 The nearest airport is Ireland West Knock Airport, 18.6 miles from the property. 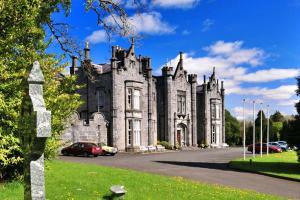 The Ballina Manor Hotel is perched on the banks of the River Moy and overlooks St Muredach's Cathedral. 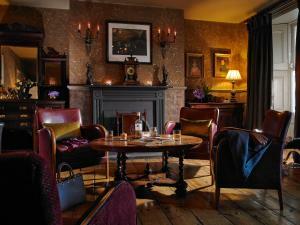 The Manor Hotel offers a fine dining restaurant and rooms with free Wi-Fi. 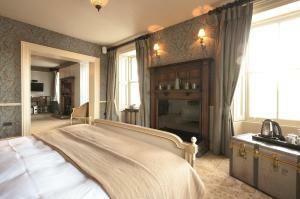 The spacious rooms at the Ballina Manor Hotel have private bathrooms with showers, baths and hairdryers. The Ridgepool Restaurant has floor-to-ceiling windows and offers panoramic views of the surrounding area. There is an international menu with fresh fish specials. In the heart of Ballina, the hotel is close to town’s shopping district. Ballina Train Station is a 5-minute walk away and free parking is available at the hotel. In Ballina's main street, this bed and breakfast is just feet from the River Moy, known for its salmon fishing. Free parking is available less than 165 ft away, and there is free Wi-Fi throughout the building. The Loft Bar and BnB is a family run property, and guests can enjoy breakfast each morning from 7:45 am - 10 am. The bar serves a wide range of drinks, there is a coffee dock for guests to enjoy, and full in-house entertainment is frequently provided. Rooms at The Loft Bar are traditionally furnished, and feature a private bathroom with free toiletries and a hairdryer. Each also has picturesque views and tea and coffee-making facilities. Walkers can enjoy some pretty forest routes within half a mile of the property. Lough Conn is 8 miles away, while the coast can be reached in around 15 minutes by car. Just a 5-minute drive from Ballina centre, the award-winning Quignalegan House offers hearty breakfasts and 4-star rooms with free Wi-Fi. The cosy BnB is located on the main N59 road. Full Irish breakfasts are served each morning, including freshly squeezed juices, homemade bread and continental cheeses. Tea and coffee are available all day in the guest lounge. 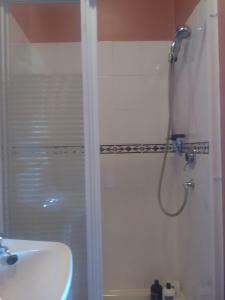 The traditional bedrooms each have a private modern shower room with a hairdryer. 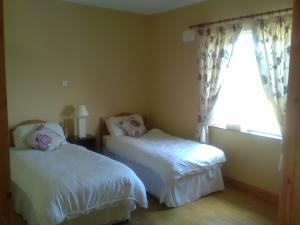 All rooms feature a TV and radio/alarm, and ironing facilities are also available. Surrounded by beautiful County Mayo countryside, Quignalegan House is a 2-minute drive from the banks of the famous River Moy. Free on-site parking is available, and historic Killala is a 15-minute drive away.